Surrounded by the Pacific Ocean, it’s easy for those of us in Hawaii to appreciate that water covers 70% of Earth’s surface. Harder to fathom is the fact that only three percent of the earth’s water is fresh, and less than one percent supports all life on land. The stark difference between “wet” and “dry” sides of our Islands has made water management pivotal in Hawaii’s history. Add to that a decrease of rainfall of 18 percent over the last 30 years; a population that has doubled since 1959; record levels of visitors; the reality that half of Hawaii’s watershed forests have been destroyed… and the result is a potential fresh water crisis. 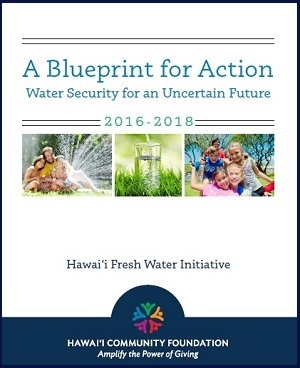 Against this uncertain backdrop, HCF created the Wai Maoli: Hawaii Fresh Water Initiative in 2013, which is currently supported by a funding partnership of 10 additional funders. The Fresh Water Initiative is designed to pro-actively address and resolve water supply issues. In order to tackle this important issue, HCF invited stakeholders from all sides of the issue — agriculture, private landowners, scientists, and government officials — to convene as a Fresh Water Council (Council). 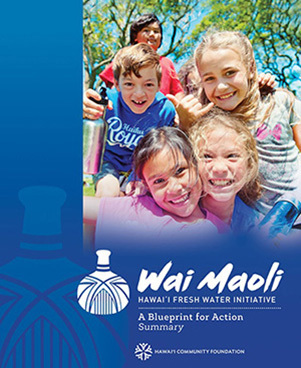 Against this uncertain backdrop, HCF created the Wai Maoli: Hawaii Fresh Water Initiative in 2013, which is currently supported by a funding partnership of 10 additional funders. The Fresh Water Initiative is designed to pro-actively address and resolve water supply issues. In order to tackle this important issue, HCF invited stakeholders from all sides of the issue — agriculture, private landowners, scientists, and government officials — to convene as a Fresh Water Council (Council). HCF asked us to do something different. We were tasked to come up with collective recommendations for improving our shared water supply, even though many members came from opposing sides regarding use. The result? A Blueprint for Action with a goal of providing 100 million gallons a day of additional reliable fresh water supply by 2030 via clear solutions that have broad, multiparty support. HCF’s approach and unique position in the community provided the space and structure to bring together the diverse stakeholders, find common ground and ultimately come to agreement . Unlike many Blue Ribbon Panels that disband after issuing their report, members of the Council have agreed to continue working together to help implement the recommendations. Water, as we know, is essential to life. And collaboration, we’ve found, is essential to protecting our quality of life in Hawaii. To achieve this goal, the council identified three aggressive targets and strategies. The team approach is already paying off. The Fresh Water Initiative is working to implement a strong, proactive agenda to protect Hawaii’s fresh water future, and avoid costly problems down the road. The Blueprint for Action lays a foundation for a sustainable water future for our state. Thus far it has helped support and pass 12 key state and county policy actions that will improve Hawaii’s ability to capture, reuse, and store fresh water—making us all a little more secure. Coordinated outreach and capacity building are also underway as implementation of the Fresh Water Blueprint for Action kicks into higher gear. The Blueprint for Action offers Hawaii’s decision makers a new vision and clear recommendations for policy changes and actions that have broad, multi-party support. There are many cautionary tales around the world. In April 2018, Cape Town, South Africa came extremely close to “Water Day Zero” but through aggressive restrictions on personal and agricultural water have bought themselves a bit more time. Other cities like Mexico City, Melbourne, Jakarta, London, Beijing, Istanbul, Tokyo, Bangalore, and the U.S. State of California have all experienced severe water shortages and at current rates global demand is projected to surpass supply by 20301. 1Laudicina, Paul, “Water Day Zero Coming To A City Near You”, Forbes. June 7, 2018. Everyone plays a role in making Hawaii's water situation better - from the plants you choose for your garden to the pipes/fixtures you use in your plumbing. This Voice of the Sea episode explores how to protect our fresh water resources in our homes and communities. Interested in learning more about our Fresh Water Intiative or getting involved with other environmental programs? Contact the Environment Program by calling 808.566.5523, or by email at environment@hcf-hawaii.org.